Brazilian jazz is probably the first type of music that comes to mind when you think of Latin jazz but there are many others, and one of the best is Venezuelan. 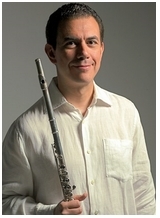 Doing his part to help expose jazz lovers to the music of his homeland, flute virtuoso Marco Granados is offering up his latest album on the Soundbrush label, the appropriately titled Music Of Venezuela. The son of a violinist/music teacher, Granados showed early promise while growing up in Venezuela. He eventually received a classical musical education that included stints at Julliard and other institutions, and he also studied with flute legends James Galway and Jean-Pierre Rampal. In the last decade or so, he’s appeared in a number of venues (including Lincoln Center) and on many albums. His newest effort is a showcase for the music of his homeland, but it also displays his instrumental talents. Although he’s accompanied by several solid musicians, including his brother Leonardo on maracas, Marco dominates almost every track with his remarkable flute play. The 15 cuts on the album include a number of styles, ranging from the sweet and slow ballads, such as “Confesion a Las Estrellas (Confession To The Stars),” to pure dancing music, such as the merengue-flavored “Cañaneando (Street Playing).” The latter is a delight, with Granados demonstrating astonishing skill and speed. It was one of my favorites. Granados also demonstrates loyalty to the simple, rural Venezuelan music of his youth by featuring several pieces written by one of his inspirations, Alberto ‘Beto’ Valderrama, a legendary musician who lives a simple life on an island off the coast of Venezuela. The best of those is “El Avispero (The Wasp’s Nest),” which includes some fiery trumpet play from guest artist Francisco Flores. This is an outstanding collection of Latin jazz, especially for those who appreciate amazingly fast and intricate flute play from a master. Highly recommended. Marco Granados is great. I saw of him performing with his ensemble. I think he will be in the bolero album of Leonardo Granados. (I don’t think they are related.) But flute in bolero music sounds interesting. Appreciate the comment. Hope you come back and visit the GMC again.